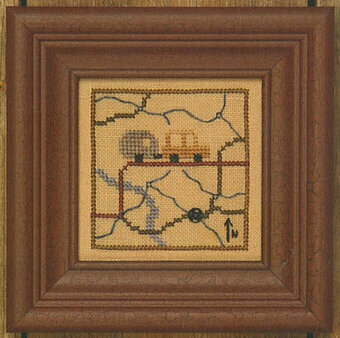 Kit Includes: Beads, Antique Brown perforated paper, needles, floss, chart and instructions. Finished size: 3.75" x 4.75". Kit includes Kit included 14 count White Aida, thread, thread, needles and instructions. 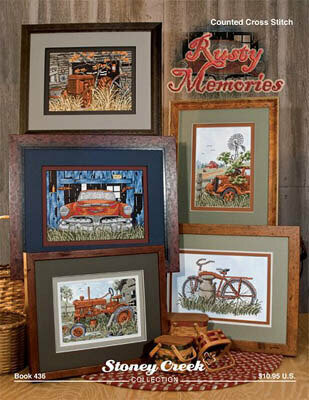 Finished size is 11.2" x 14"
Cross stitch kit featuring a race car. 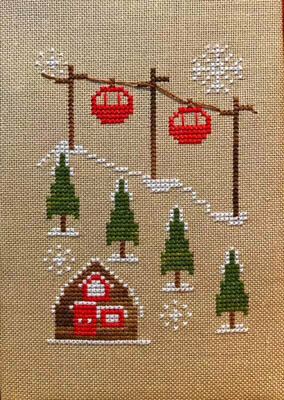 This cross stitch kit contains 14 count white Aida Zweigart fabric, stranded cotton threads (7 colors), needle, instructions and color chart. 6.25" x 5". 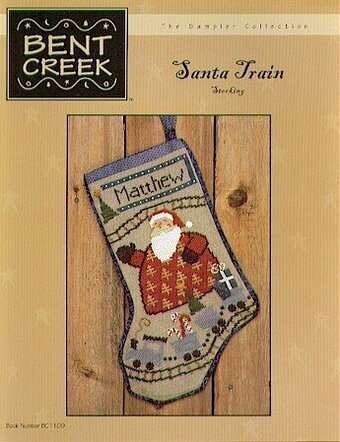 Little boys will love this stocking featuring Jolly Old St. Nick and a cute litte train. Model stitched on 18 Ct. Natural linen using four strands of floss over two threads of linen, with Weeks Dye Works and Gentle Art Sampler Threads. Stitch Count: 97W x 146H. Buttons from Just Another Button Company sold separately. Model stitched on 14 Ct. White Aida with DMC floss. Stitch Count: 336W x 224H. Model stitched on 32 Ct. Lt Mocha linen with Weeks Dye Works (Cocoa, Bark, Galvanized), Gentle Art Sampler Threads (Liberty, Weathered Barn, Cidermill Brown) and DMC (3371). Stitch Count: 40W x 40H. 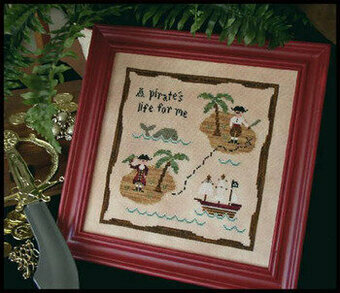 Kit includes 14 count white aida fabric, threads, needles and instructions. Finished size is 14" x 22". Model stitched on 14 Ct. White Aida with DMC floss. Stitch Count: 115 x 160. Designed by Ursula Michael. 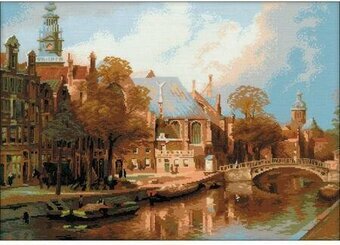 Cross stitch kit featuring a European canal. 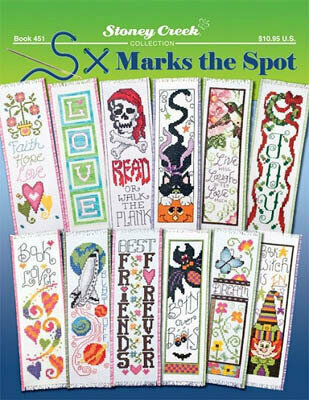 This cross stitch kit includes 14 count Aida Zweigart fabric, Safil wool/acrylic and Anchor stranded cotton threads (26 colors), needle, instructions and color chart. 21.25" x 15.75". 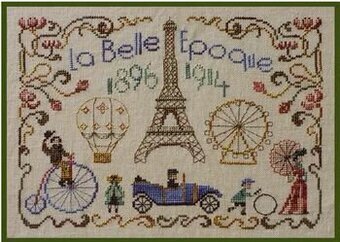 Complete kit includes 14 Count Blue Aida fabric, pattern, threads, needle and instructions. Finished size: 13.6" x 13.6"
Finished Size: 43" x 34" (109 x 86 cm). 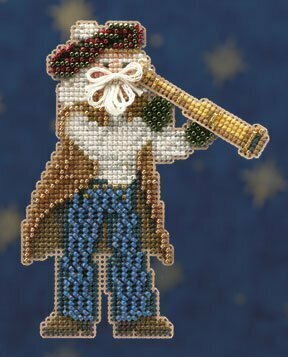 Model stitched on 28 Ct. Heavenlee Creations Atmosphere Lugana with Sullivans floss or DMC floss & Kreinik #4 Braid. Stitch Count: 89H x 60W. Model stitched on 14 Ct. White Aida with DMC floss. Stitch Count: 57H x 283W. Cute signpost design by Ursula Michael. "Don't Miss the Boat - Beach - Al's Bait Shop". Model stitched on 14 Ct. white Aida using DMC floss. 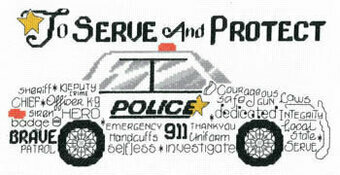 Design size approximately 5 3/4" x 9 3/4". Finally--a book for fans of space travel! 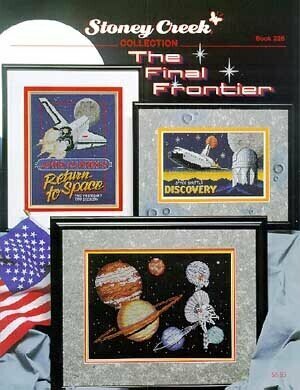 This exciting book features patterns for John Glenn's Return to Space stitch count 128x168, The Planets stitch count 104x125. Passing Saturn stitch count 180x132. The Space Shuttle Discovery stitch count 144x86, Space Walk stitch count 158x101, The Voyager's Tour stitch count 201x142. Model stitched on 32 count Antique Ivory Belfast fabric with The Gentle Arts Sampler Threads (or DMC floss 503, 3021, 3830, 950, 729, 640, 340). Stitch Count: 140W x 105H. "There comes a ship far sailing then...Saint Michael was the stieresman, Saint John sate in the horn. Our Lord harped and Lady sang and all the bells of Heaven they rang. On Christ's Sonday at morn." Model stitched on 28 Ct. Misty Blue Cashel linen with DMC Pearl cotton, Gloriana Silk, Dinky Dyes Silk, Kreinik Silk Mori, DMC floss, Kreinik #4 Braid, Needlepoint Inc Silk, and SJ Designs beads. Stitch count: 198H x 64W. Finishing instructions included. 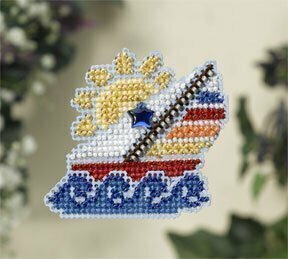 An accessory pack is available that contains all of the threads and beads needed to complete the design as shown. 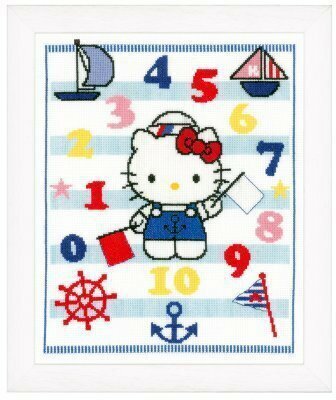 Kit includes 14 Count White Aida, cotton floss, needle, chart, and instructions. Finished size is 11" x 8" each. 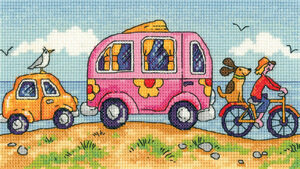 Kit includes 14 Ct. Light Blue Aida, pattern, thread, needle and instructions. Finished size is 14" x 14". Shown finished as a pillow. Kit includes 14 Ct. white Aida, DMC cotton floss, floss separators, needle, & chart. Finished size: 10" x 13". 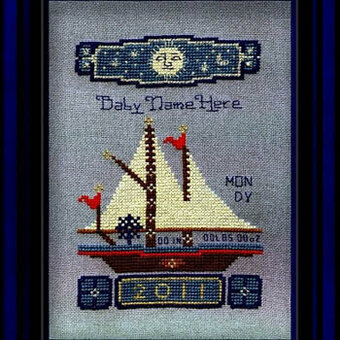 Cross stitch kit featuring a duck in a sailboat. 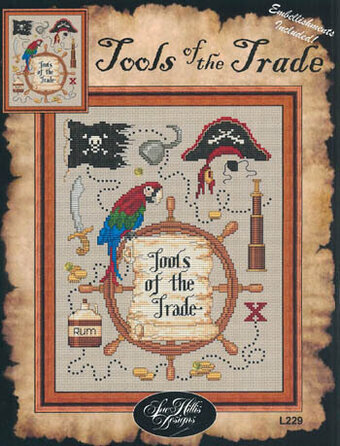 This cross stitch kit comes complete with 14 Count Aida Fabric, 100% Cotton Embroidery Floss, #24 Tapestry Needle, Fully Illustrated Instructions. 5" x 7". 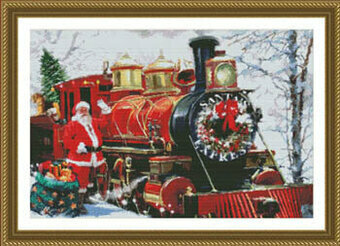 All aboard the Santa Express! 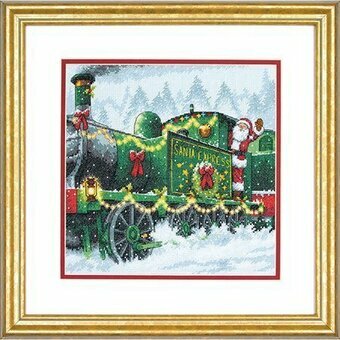 Featuring Santa Claus himself as the engineer, this delightful counted cross stitch design by Dimensions will charm young and old alike. Finished size: 10" x 10". Illustration by Simon Treadwell. 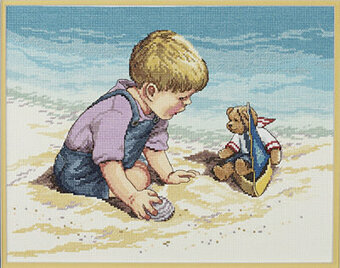 This counted cross stitch kit includes: Presorted cotton thread, 14 count light blue Aida, Needle, and Easy instructions. Stitch Count: 184W x 91H. Model stitched on 28 Ct. White Jobelan using DMC floss. Model stitched on 28ct. Summer Khaki Lugana with DMC embroidery floss. 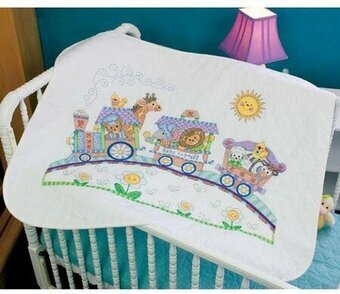 Includes embellishments. Stitch count 99W x 126H. 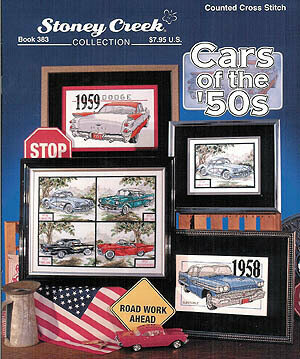 Will perfectly fit into a standard 8 x 10 frame when stitched on 14/28ct fabric.